DePaul midfielder Istvan Wilhelms battles Providence defender Malcolm Duncan during DePaul’s 2-1 overtime win over Providence. In the 35th edition of Big East soccer, DePaul kicked of conference play with a dramatic 2-1 win over Providence in double overtime. For the second straight season these conference rivals met in the Big East opener and just like last season double overtime was needed to find a winner. However, unlike last season when both teams settled for a draw, the Blue Demons were able to find a winner this time around. 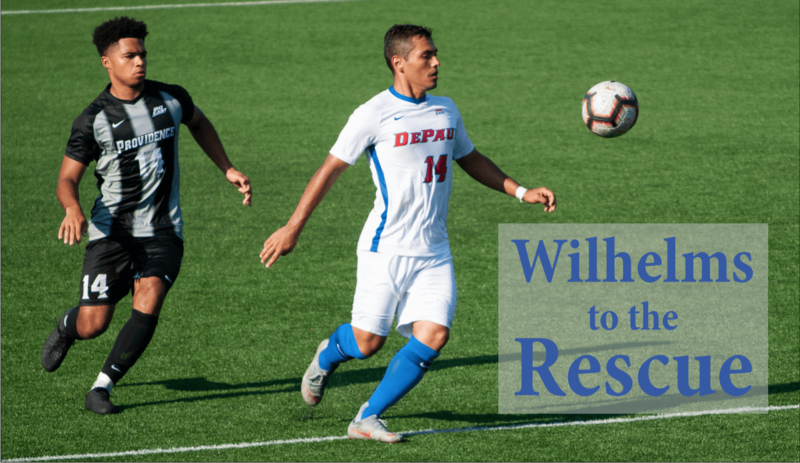 DePaul didn’t create many scoring opportunities after going up 1-0 less than five minutes into the game, but they relied on the scoring services of sophomore midfielder Istvan Wilhelms who bagged his first brace of the season. couldn’t hold onto the ball and that allowed Wilhelms in for an easy finish. in the first half. In fact, even though they outshout DePaul 13-8, the Fryers had five less shots on goal than DePaul (6-1). Providence was able to find the back of the net with their one shot on goal in the 51st minute when Providence junior midfielder Tiago Mendonca put away a rebound in the bottom corner. DePaul had a couple of chances to score in the second half, but were never able to create anything too dangerous. “We had to take it play-by-play, step-by-step and wait to get our opportunities, but once we got that one chance we were able to put it away,” Wilhelms said. During the first 15 minutes of double overtime neither team created any goal scoring opportunities as both teams struggled to keep possession of the ball. However, with less than five minutes left, freshman midfielder Jake Fuderer hooved a long ball onto to the running freshman midfielder Jack Richards who headed the ball down to the sliding Wilhelms. Prior to beginning conference play, DePaul was predicted to finish dead last in the conference in the preseason coaches’ poll, while Providence was predicted to finish tied for fourth in the Big East. “A big motivator for us was being picked to finish last in the Big East, everyone knew that in the back of their mind and we had something to say about that today,” Hilling said. Not only did this win give DePaul all three points, but it helped break a long winless streak against Providence and in Big East openers. In their seven prior meetings, DePaul has never beaten Providence before Friday. They have had some close calls with a couple of games going to double overtime multiple times, but it was Providence who had the Blue Demons number up until Friday. Also, the win helped break a long winless drought streak in Big East openers. The last time DePaul won a Big East opener was in 2014. “It’s so hard to get points in this conference and when you can get three points against a really good team it gives us a lot of confidence heading forward,” Plotkin said. DePaul will have a non-conference matchup against its inner-city rivals Loyola – Chicago at Wish Field on Tuesday 3 p.m. When these two rivals met last season at Loyola they ended up drawing 2-2. Loyola took the lead in the first half, but DePaul responded with two goals in the second half to take the lead with 15 minutes left to play. However, as the game continued to dwindle down the Ramblers found an equalizer with three minutes left in the game. DePaul will finish the week by resuming conference play on Friday when they travel to the nation’s capital to take on Georgetown at 2 p.m.